I trying to update libraries from 27.0.2.1 to 28.0.0. But an compatibility error raises. Unable to resolve dependencies. 'Xamarin.Android.Arch.Core.Common 26.1.0' is not compatible with 'Xamarin.Android.Arch.Core.Runtime 1.1.1 constraint: Xamarin.Android.Arch.Core.Common (= 1.1.1)', 'Xamarin.Android.Arch.Lifecycle.LiveData 1.1.1 constraint: Xamarin.Android.Arch.Core.Common (= 1.1.1)', 'Xamarin.Android.Arch.Lifecycle.LiveData.Core 1.1.1 constraint: Xamarin.Android.Arch.Core.Common (= 1.1.1)'. When updating Forms nugets when you create a black template solution just update the REQUIRED nuget packages, don't update all. It's a bit of a pain and usually catches people out. Did you find a way to deal with this? I think the problem is that Xamarin.Android.Arch.Core.Common doesn't really have a 26.1.0 version? 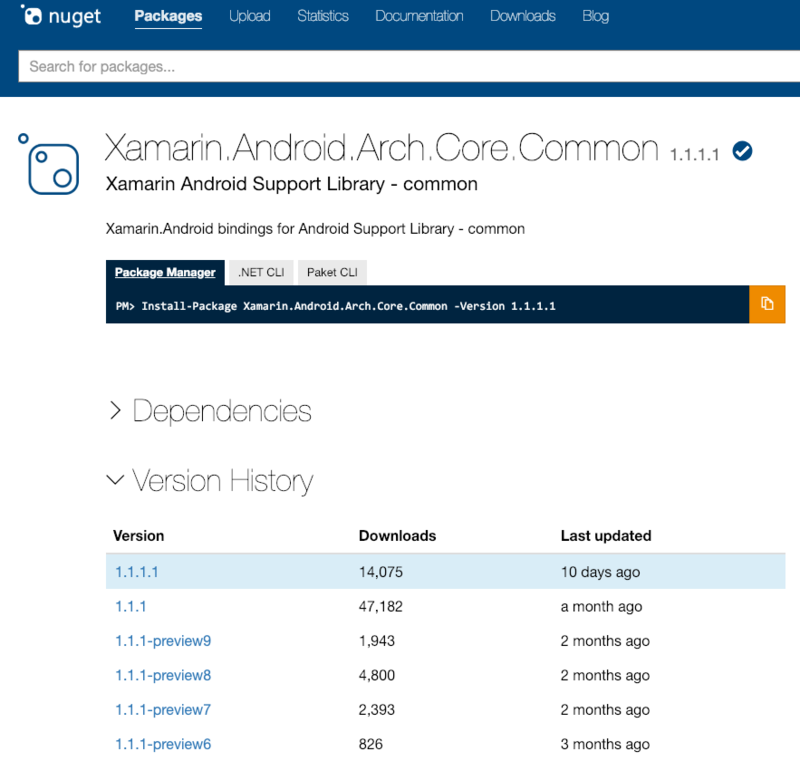 I manually edited the packages file and got my Xamarin.Android.Arch.Core.Common and Xamarin.Android.Arch.Core. Runtime to update to 1.1.1.1. But then other troubles cropped up with the update. Now, Xamarin.Forms Update (from 3.4.0 to 3.5.0) throws that error! Gathering dependency information took 8.5 sec Summary of time taken to gather dependencies per source : /Users/pgayko/Documents/workspaces/m.ergon.ch/dotnet/packages - 111.14 ms https://api.nuget.org/v3/index.json - 30.59 sec Attempting to resolve dependencies for multiple packages. Unable to resolve dependencies. 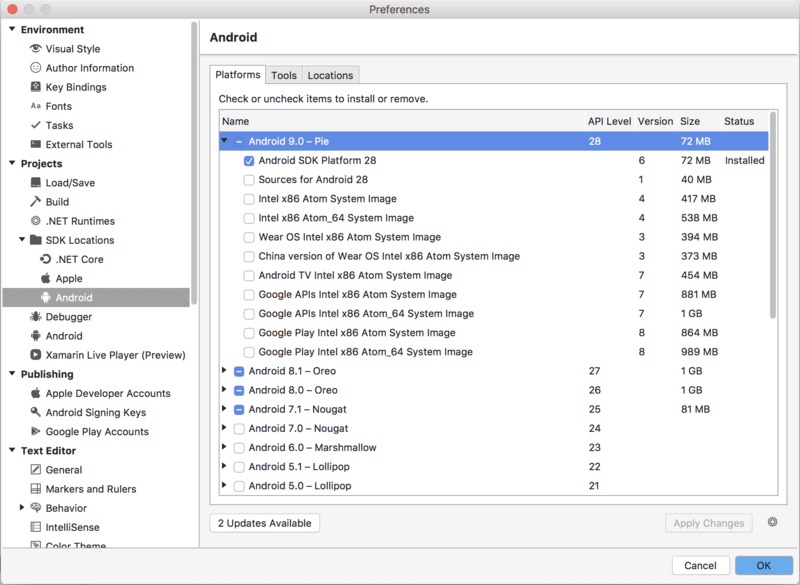 'Xamarin.Android.Arch.Core.Common 26.1.0' is not compatible with 'Xamarin.Android.Arch.Core.Runtime 1.1.1.1 constraint: Xamarin.Android.Arch.Core.Common (= 1.1.1.1)', 'Xamarin.Android.Arch.Lifecycle.LiveData 1.1.1.1 constraint: Xamarin.Android.Arch.Core.Common (= 1.1.1.1)', 'Xamarin.Android.Arch.Lifecycle.LiveData.Core 1.1.1.1 constraint: Xamarin.Android.Arch.Core.Common (= 1.1.1.1)'. What do I wrong, or whats wrong with that stuff?